The film The Holiday always comes to mind when I hear the term “home swap.” Swap homes with someone living in a foreign country, fall in love with a dapper Englishman, befriend a lovely older neighbor, immerse yourself in a different culture and find yourself along the way–sign me up! 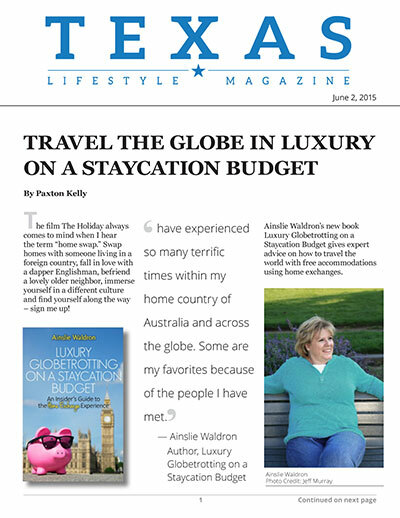 Ainslie Waldron’s new book Luxury Globetrotting on a Staycation Budget gives expert advice on how to travel the world with free accommodations using home exchanges. Chapters include What to Look for When Choosing a Home Exchange, How to Attract Home Exchanges, Where to Go and How to Behave, Insurance and House Swap Adventures. “I cannot sing the praises of house exchanges loudly enough. I reckon it’s one of the world’s best-kept secrets. In fact, I would go so far as to say I have found it one of the new Wonders of the World,” she says. Ainslie was a successful business woman in Australia when she decided to step away from a life centered around work and travel the world in a way that allowed her to enjoy life’s luxuries on an affordable budget. Geared toward retirees or people who are semi-retired and have a lot of free time, but are lacking the funds for month long trips to places like Athens, Maui or Nepal, Waldron makes these trips possible with her how-to guide for home exchanges. Even if you’re young and just starting out or you’ve dedicated 20 years to the 9-5 workday gig, Waldron’s book is an invaluable resource for anyone interested in staycation vacations. Take a look at my Q&A with Ainslie and hear all about her current staycation adventure! Q: How did you get introduced to home swapping? A: I met a friend, who had been successfully house swapping for a couple of years, and he explained it all to me. I asked lots of questions. It sounded like an ideal way to travel in luxury for free. I tried it once, and became convinced and hooked! Q: Have you found that most people are open to the idea of home swapping or are they wary of it? A: I have found reactions are mixed. I think that it may depend on what type of outlook on life you have. Some people just do not like the thought of anyone else having access to their home and their private possessions. I can fully understand this position, and that is why I always suggest that all personal, private and precious things be locked securely away in a locked cupboard or bedroom which guests cannot access. What people find precious is always very personal. It may be a good china coffee-set that you inherited from your grandmother, or it may be your daughter’s first baby tooth. It is very acceptable to leave a room locked which guests cannot use. Everybody understands. However, if you really cannot accept the thought of others in your home, then house swapping is not for you! Q: What is the preliminary process like? Are there many conversations between both parties when setting up the home exchange? A: This varies a lot. Some people have more conversations than others. Usually it begins with an email enquiry. All details of the homes for swap are already on the websites, including photos, so both parties usually have a good idea of what the house is like. After initial email contact, a few emails usually go back and forth, quite often, but not always, followed by phone or Skype calls. There are usually fine-tuning details, like how to obtain the house keys, and this is sometimes easier done by phone. Q: What made you decide to write Luxury Globetrotting on a Staycation Budget and share your home swapping knowledge? A: I wrote it because so many of my friends and acquaintances asked me endless questions about home exchanging. Friends were envious of my lifestyle, and wondered how I could live in luxury for so many months. Some thought I had won the lottery or something. Once I tell friends about house swapping, they ask questions, usually only a couple at first, and then it generally escalates to lots of questions, which is understandable curiosity. I found it easier to write the answers down in one place, and then I could answer only a couple of questions and then direct them to the e-book, which is inexpensive and full of extremely practical advice. Many have commented that it has been very helpful. Q: Which section of your book do you find your readers have the most questions and inquiries about? A: I think readers like the Frequently Asked Questions (FAQ) section the most. This is probably because it is full of real questions, with my practical answers. When I was writing the book, I saved up the Q & A from friends; I also invited some to send me any of the questions they still had. That is how that section developed. People enquire about all of the sections, but none have outstandingly more enquiries than others. Quite a few seem to enjoy Ainslie’s Adventures, and ask me if the stories are factual, which indeed, they are. Q: What’s one experience you can share with us where a homeowner went above and beyond to accommodate you? A:I have so many it is difficult to pick one. On many occasions, we have been taken out for dinners, received gifts of lovely food and wine, been invited to stay in additional houses in beautiful areas, sometimes the vacation houses of friends and relatives of the home exchangers. For example, in one exchange in Vancouver, Canada, the couple asked if we intended to visit Whistler and we said that we were thinking of going there. The couple handed us a set of keys and said, go stay in this house, it is the vacation home of my sister, and she is not using it. The house was beautiful and there is a photo of it in the book. Another couple in Canada asked us if we like fishing, which we do. They took us fishing for salmon and we spent a night in a floating cabin with them, another wonderful and unplanned adventure. It turned into a real escapade when some bears turned up – that story is in the book, too. Q: You mentioned you have a main home exchange site, as well as a backup one, that you use. What site do you frequent the most? A: I don’t like to advertise any particular site, as many of them are good. Some are better for houses in certain parts of the world than others. I advise people to do as I have done, and still do. Have a look at the sites out there, and browse through them, and read up within them. Read reviews of them on the internet, before joining any of the sites. Most charge a small annual fee, so I always like to do my research, before parting with any money. Q: I love the True Stories from Travel Agencies at the end of each chapter! Are these stories you’ve picked up from traveling? A: Some of these are stories I have picked up traveling, others are stories that friends have told me. I thought it would be interesting to have some light relief throughout the book. Sometimes reading practical details can become a little tedious, and I thought that a sprinkling of humor would be welcome, and feedback I have received is that people like it. Q: Which of your staycations has been your favorite and why? A: I find this an almost impossible question to answer, as I have experienced so many terrific times within my home country of Australia and across the globe. Some are my favorites because of the people I have met. These tend to be people my own age, with similar travel interests. It is amazing how many really great friends I have made in the last few years. I never dreamt that I would be making new and interesting friends at this stage of my life, yet I can say that some of the people I have met house swapping are now amongst my best friends (although they may live on another continent). Other house swaps are memorable because of the location, as they are in locations I have longed to visit, with nearby sites to see. Locations within a short drive to ancient Troy; the lost city of Pompeii; the Great Barrier Reef; Niagara Falls; London; Geneva; Prague and many more. Others are memorable because of the house itself, and there have been many beautiful homes with magnificent lounge rooms, bedrooms, decks, wonderful fitted kitchens, swimming pools, gyms, spas, and views to die for. Q: What home exchange adventure are you currently on? A: I am currently on a four month trip in Europe. We left Australia on April 15th and the first house was in Turkey. We chose Turkey as this year was the centenary of Gallipoli when many Australian and other troops died during World War I in the Dardanelles of Turkey. There was a massive dawn service memorial, with 10,000 Australians and New Zealanders in Turkey for the service. We then moved exchange houses within Turkey, to experience the different areas. We enjoyed shopping in the amazing Grand Bazaar in Istanbul, the only city in the world which spans two continents (Asia and Europe); visiting Troy and other ancient places; and sunning ourselves in the tourist resort of Bodrum on the Aegean coastline. Both homes in Turkey had private swimming pools. After three weeks in Turkey, our next stop was Greece, where we stayed in a villa for three weeks, with a view to die for. It was perched on a hilltop with 300 degree views of the Aegean sea. It was on the island of Syros, which is a lovely quiet island. We were able to go island hopping while based there, and really enjoyed the laid back island lifestyle. Then we moved to Italy, where we were in an apartment in the quiet mountain village of Rocca Di Mezzo, which was about an hour west of Rome, and an hour east of Pescara on the Adriatic Sea. We visited the Vatican and other famous sites in and around these areas. We also had a day in the ancient ruins of Pompeii, which had been devastated by the eruption of the volcano Vesuvius in A.D. 79 during Roman times. Next stop was an apartment on the French Riviera, in Nice on the Cote D’Azur, with views of the Mediterranean. While there, we visited many famous places, such as Monte Carlo, Monaco, San Remo, Cannes and Antibes. I felt like Princess Grace (Kelly) as we drove round the windy mountain coastal roads in the comfortable large Peugeot car that our hosts had given us. Then a quick trip to Paris for Bastille Day celebrations. I am writing from Paris now. The rest of this planned trip are houses in Chester in England and in my native Scotland, then home for a well deserved rest before planning my next adventure.